I bought an eight-pack of plastic eggs at Target for 99 cents. These eggs are slightly larger than the standard eggs, and a dollar in the Dollar Spot, but 99 cents in the Easter section. What's that all about? Anyhoo, I also picked up some Starburst jelly beans (the only good ones, imho) and some Robin's eggs to fill the eggs with before dropping them in the mail. My sister also got a lip balm from Homespun: Modern Handmade, although I could barely fit any jelly beans in there with it! I think these had about 10 jelly beans in them. I couldn't even fit any Robin's eggs in this one. Sheesh! I put four 44 cent stamps on these, which is probably overkill but I have a roll of the old non-Forever stamps, plus a roll of the new Forever stamps, so better safe than sorry. 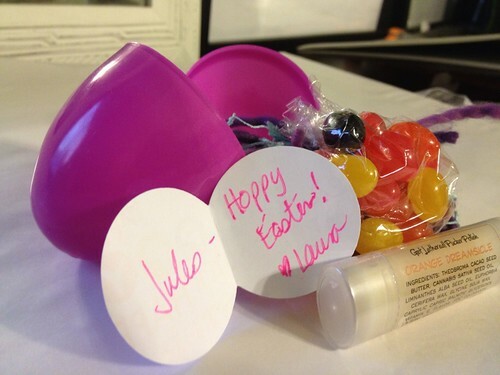 I sent out a few of these little eggs, so I hope the recipients like them!